The Blackmud Creek Community League has qualified for a 2018 Summer Green Shack Program in the neighbourhoods of Allard (at the rink site) and Blackmud Creek (at the playground site). The summer Green Shack Playground Program runs Monday-Friday (2:30-6pm) in Allard Park and Monday-Friday (10:00am-1:30pm) in Blackmud Creek Park from July 3rd to August 23rd. Sites are selected based on the attendance of drop-in programs in the previous year. The program is also made possible by monetary contributions from community leagues. Programming includes games, sports, crafts, music, drama, and special events. The program is most suitable for children ages 6 to 12 years old; it is recommended that participants 5 years or younger be accompanied by a parent or guardian. The Blackmud Creek Community League has also been selected to receive Pop Up Play programming from the City of Edmonton in Blackburne Creek and Richford in 2018. The Pop Up Play Program will run in Blackburne Creek Tuesdays and Fridays, July 3rd to August 23rd, from 10:00pm-1:30pm. The Pop Up Play Program will run in Richford Mondays and Wednesdays, July 3rd to August 23rd, from 2:30pm-6:00pm. The KidSport mission is simple - they believe that no kid should be left on the sidelines and all should be given the opportunity to experience the positive benefits of organized sport. KidSport Edmonton is one of more than 170 communities across Canada that works locally to identify the needs in their community, raise funds, and support programs that, in keeping with the KidSport mission, create new opportunities for young people to participate in sport. Through an application process, KidSport provides grants to help with the cost of registration fees for organized sport programs. Click to download the KidSport Intro Letter. To help promote fitness and involvement in sports and recreation programs for our children, the YMCA of Edmonton is participating in a program to assist low-income families with the cost of these activities. Jumpstart is an initiative from the Canadian Tire Foundation for Families. The purpose of the program is to assist low-income families in accessing physical recreation programs for children ages 5 to 18 years. Call the YMCA at 780-429-9622 or go to www.canadiantire.ca/jumpstart for more information and an application. 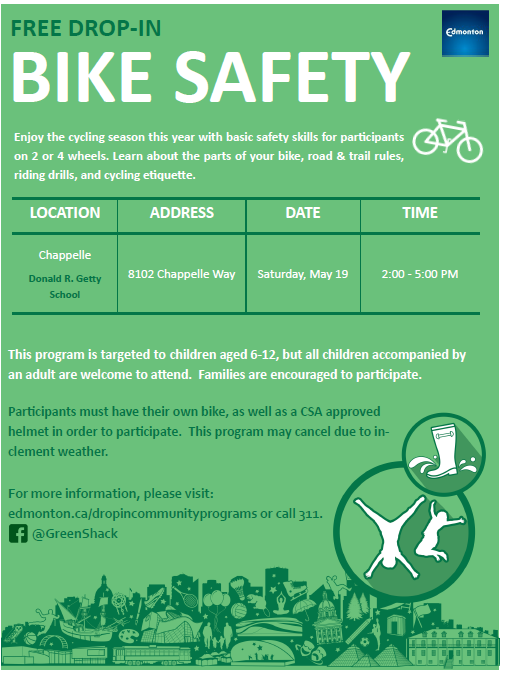 A City of Edmonton Bike Safety Program is planned to happen at Chappelle on May 19th 2018, from 2:00am-5:00pm. There will also be a Fall bike safety program at the Allard Rink Sunday, September 16, 2018 from 2:00-5:00pm. The Leisure Access Program provides qualifying low-income Edmontonians with free unlimited admissions to several City of Edmonton recreation facilities. To obtain an application form for the program or for more information, visit your neighbourhood Leisure Centre, or go to www.edmonton.ca/lap or call 780-496-4918. These clubs offer free recreational, social, and educational programs. Their nine clubs are located throughout the city. For more information visit www.bgcbigs.ca or call 780-424-8181.